The kit is BACK! We've located another large batch of these QR clamps, and will continue selling these little gems until we run out again! They are hard to find at reasonable prices, so if you've been thinking about building one or two of these, now's a pretty good time to order! Many of you have wanted to build the Quick Release Indicator Clamp, but have had a bit of trouble finding a suitable lever-bolt, like the one I got from a used bicycle wheel skewer. clamps. (A very high-stress application.) The company wholesaled the lot to us, and we made up a large batch of kits, which quickly sold out. We've been turning down orders ever since. But, we just ran across another lot, and again bought all they had! We re-drew the plans again, to include the basics for using this kit as a micrometer lathe stop, added that to the original package, and are now able to offer a complete parts and plans kit for the project for just $12.95 (plus s/h) AGAIN, sadly, while supplies last. We originally thought this kit would be a one-time offering, as I never expected to be able to find another lot of these great little QR-clamps. Happily, we have, and we'll continue looking for another source, as these kits are very popular. But, there are no guarantees that we'll have a third lot for sale, so don't delay if you've been wanting one! The kit consists of the Q-R bolt, one 4x40 socket-head cap screw, a 5" piece of 1.00"x .625" aluminum stock, (which is big enough to supply more than enough material to ensure nice, square and accurate finished parts,) and three pages of drawings and notations. This GT Quick-release lever is a really nice unit! It uses a ball-and-socket configuration to cut down on friction, allowing a lot of clamping force without much effort, and the slick black finish is extremely durable. I believe it's really thick powder coating, although it could be some sort of hard-wearing enamel. Whatever it is, it should wear very well. The lever comes with a hard plastic socket washer, a cup for the washer, and a straight-knurled finger-nut also made from aluminum with the same tough finish. The new plans not only feature a thinner jaw for easier installation / removal from the lathe, but also take advantage of the durable socket washer, countersinking it into the surface of the clamp body to make a nice, recessed lever mount that is practically frictionless to operate. 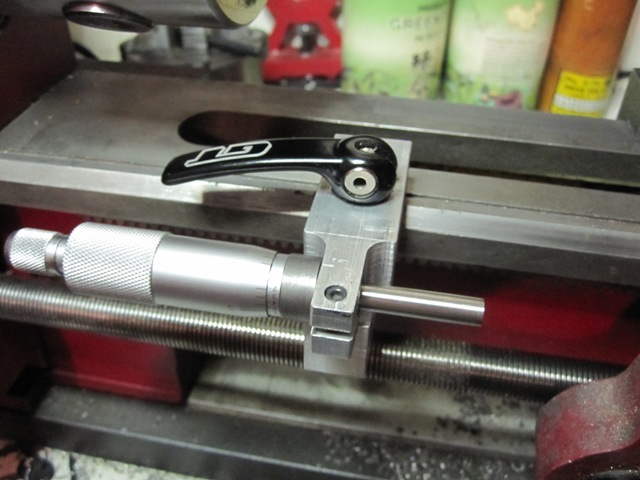 This clamp can also be easily modified to work with a micrometer body, making it a micro-adjustable carriage stop! Other than that, it's basically the same, easy-to-make clamp design, with no compound curves or advanced skills needed. This is a novice-level project. It's not only fun to build, but will be an extremely useful attachement for your mini lathe, one you'll use for years and years to come.